Calcott Architecture and Landscape Design Ltd were again prominent in the ADNZ (Architectural Designers of New Zealand) Regional Awards held in Palmerston North recently. 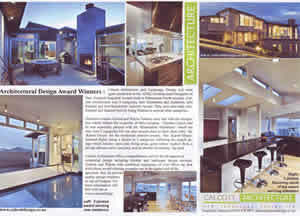 Calcott Architecture won 3 categories, best Alterations and Additions, best Kitchen and best Residential Interiors Award. They were also high commended and featured heavily being finalists in several other categories. Directors Graeme Calcott and Wayne Tansley were rapt with the recognition which reflects the versatility of their company. 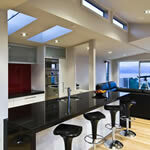 Graeme Calcott said he was especially pleased with the ‘Khandallah Alterations’ which not only won 2 categories but was also second place to their other entry the ‘Karori House’ for the residential interiors award. The ‘Karori House’ featured highly being a finalist in 5 categories reflecting the superb design which features open plan living areas, great indoor outdoor flow, a private alfresco style courtyard, and an interior swimming/lap pool. Calcott Architecture offer a comprehensive service for all aspects of residential design including kitchen and landscape design services. Graeme and Wayne with combined experience of over 50yrs say that while these award winning examples are at the higher end of the spectrum they do provide quality design solutions to suit all budgets. 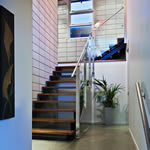 For more information visit their web site at www.calcottdesign.co.nz.